LAUREN Ralph Lauren ABBOTT II Dress Pointed Toe Kitten Pumps Port Velvet SZ 6.5. Shipped with USPS Priority Mail. Insole Length: 10". Bottom Sole Length: 10.5". Width: 3.25". Shoes are in pre-owned condition with normal wear. Black cut velvet pointed toe mule style shoes by Hype. They feature a 1 3/4" kitten heel, are marked a size 6 1/2 M and are in excellent condition, very gently used. The Nora is a 3" suede pump. DONE - WE'LL TAKE IT FROM HERE! The heels have a velvet feel and the feathers are full. Number 30 is written on the bottom of the right shoe. I was unable to remove it. You are buying a pair of Mondolfo 3" black high heels. Shoes are still in good condition. David Evins Womens Size 7 B Classic Pump Heels Suede Velvet and silky bow Black Italy. Used once. Comes with original box. ~ Fabric: A Beautiful, Rich, Crushed Velvet. ~ Size: 10M. ~ Toe Design: Front Toe Area Of Slides Has 3, Large, Rectangular-Shaped Grey Stones On Gathered Tulle & Raw Hem Polyester Fabrics. Your patronage is genuinely appreciated. 3" kitten heels, also covered with crushed velvet. Cause4Paws supports Local & Nebraska Animal Charities & Rescue Organizations. These shoes run small. Burgundy red. Velvet upper, leather soles. In good overall condition. Such a cute and unique pair of shoes to add to your wardrobe! "Add to Watch List" button near the price. Charles Jourdan Black Velvet Bow-Tie Kitten Heel Slingback Pumps Sz. 7 MINTY! 7 in MINTY and VERY gently pre-owned condition showing VERY light, slight and gentle use. These look like they were worn once but I doubt twice. Leather and fabric upper and leather balance. Made in Italy size 37. Heel is 2". KATE SPADE. It is an authentic KATE SPADE. If you don't find what you are looking for just ask and we will let you know if we have it. ORIGINAL BOX NOT INCLUDED. The pictures shown are of the actual item. If you are dissatisfied, have any issues or concerns. Pointed Toe. Velvet with Satin Trim. 2.25" Heels. Two-Tone Brown. On the bottom of the leather sole is embossed “PRADA Made in Italy 38 Vero Cuoio”. Black Satin with a black velvet bow on top. Sorbet Black. Kitten Heel. Simply Vera. Wear shows on bottoms see pictures. Nina Red Suede Leather Dress Pumps Shoes Sz 6M Adorable ! 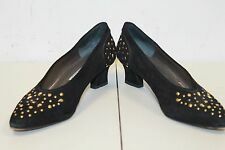 NEW WITH BOX BANANA REPUBLIC HEDY TOO NAVY VELVET WITH RHINESTONES SIZE 6. The slingback silhouette, in an oh-so comfortable kitten heel. Velour Styles: 100% Velvet. Decorative Fabric Styles: 50% polyester, 50%. A BIG ROSE WITH RHINE STONES UPFRONT. VERY COMFORTABLE SHOES! Up for sale is a new pair of quilted velvet heels from Marc by Marc Jacobs. These beautiful shoes are made from dark brown velvet with patent leather cap toes and heels and pink grosgrain ribbon trim. Like new/worn once or twice.